The truly memorable first track says it all: “It Don’t Make No Sense”. All six minutes plus is a good reason for buying this record. Not since the days of Country Joe can I remember my conscience being roused politically so much by a track and an album. “People must have lost their minds,” Brad Lauretti sings with languorous feeling! As he attempts to internalise all that is wrong at the moment, he is able to involve us in the picture: “One million refugees and everyone looks just like you and me. It don’t make no sense.” The mood and message is backed by the pedal steel of Adam Kurtz, Sadie Frederick (who sings and plays violin), Cash Carter (Drums). Ryan Vogel (Bass), and Jon Lloyd (Keys). Such a catalogue of world wide faults profoundly affects the listener. Brad has waited three years to record this, his fourth album. In that time, he has been on the road in the States, and in Europe, including London, and in 2009 at the End of the Road Festival. The name of the band is a reference to Woody Guthrie’s guitar graffiti “This Machine Kills Fascists.” Here, “This Frontier Needs Heroes” is an invitation for everyone to become a hero in their own right. Brad particularly reveres the musical work of Billy Bragg. Brad recently took part in a Songwriting Residency in Florida where Woody Guthrie composed many of his best songs including “Stetson Kennedy.” Try to listen to Bragg’s version of that song which had a profound effect on Brad. 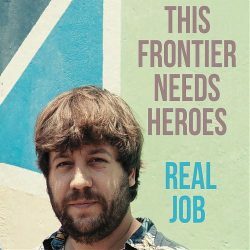 This Frontier Needs Heroes have nailed it with this album. Don’t miss them. An old fashioned Americana protest band. Perfect for Now!